Anatomically designed with a perfect left/right specific fit, 1000 Mile Cross Sport Socks are single layer, mid-weight padded socks for use across multiple sport activities, including running, work outs, cross training, and other kinds of recreation where comfort and support are needed, with padded zones and ventilation throughout. 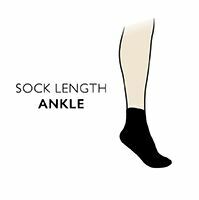 The socks are made from a soft yarn mix designed to keep feet comfortable, cool and dry under pressure, optimise moisture management, and reduce friction and irritation. The ankle design provides light structured support and cushioning for the ankle bone and the Achilles, while an arch brace helps to prevent the sock slipping during exercise.